Recipient of the 2014 International Association for Relationship Researchers Book Award! This multidisciplinary text highlights the development of romantic relationships, from initiation to commitment or demise, by highlighting the historical context, current research and theory, and diversity of patterns. Engagingly written with colorful examples, the authors examine the joy, stress, power-struggles, intimacy, and aggression that characterize these relationships. Readers gain a better understanding as to why, even after the pain and suffering associated with a breakup, most of us go right back out and start again. Relationships are examined through an interdisciplinary lens –psychological, sociological, environmental and communicative perspectives are all considered. End of chapter summaries, lists of key concepts, and additional readings serve as a review. As a whole the book explores what precipitates success or failure of these relationships and how this has changed over time. Analyzes the latest and most important scholarship. The book opens with an introduction followed by a historical overview of the development of relationships. Next relationship development models are examined including the influence of social factors and the interaction of the partners involved. 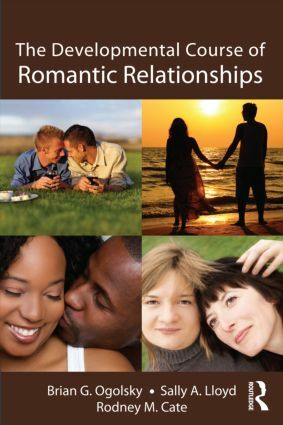 This volume examines how partners initiate romantic relationships, including infatuation, sexual attraction, and the impact of technology; how cohabitation affects the quality of the future of the relationship; and the individual, social, and circumstantial factors that predict stability or break-ups in romantic relationships. The book ends with an examination of the “dark side” of relationships, and suggestions for future research on romantic pairings. Intended as a supplement for advanced undergraduate or graduate courses in marriage and family, personal/close/intimate relationships, or interpersonal/family communication taught in human development and family studies, psychology, social work, sociology, communication, counseling and therapy, this book also appeals to researchers and practitioners interested in the romantic relationship processes.